From a consumer's point of view, internet shopping is great: huge choice and prices to fit every pocket. Sure it takes a day or two to come but that only increases the rush while you wait for the delivery.....only that's the snag. Many of us are in work when the delivery comes to our empty homes and either the delivery service takes it back to their depot or you parcel lies at risk of theft until you get home. BoxLock have an ingenious solution and Todd unlocks its potential with Brad. BoxLock is an internet-connected smart padlock with a built-in barcode scanner. To use BoxLock, you first get a secure container or bin which can be locked using a traditional padlock - it's usually called a hasp - and put it out front. The BoxLock then goes on the bin instead of the padlock. When the delivery driver arrives, he (or she) simply grabs the BoxLock and presses the button on the top to scan the tracking number on the package. The BoxLock checks online via wifi and only packages addressed to you and that are actually out for delivery that day will unlock the BoxLock. The driver opens the container, places your package safely inside and then closes it all up. Your BoxLock smartphone app then notifies you which package was scanned and that your BoxLock is safely locked with your packages inside. 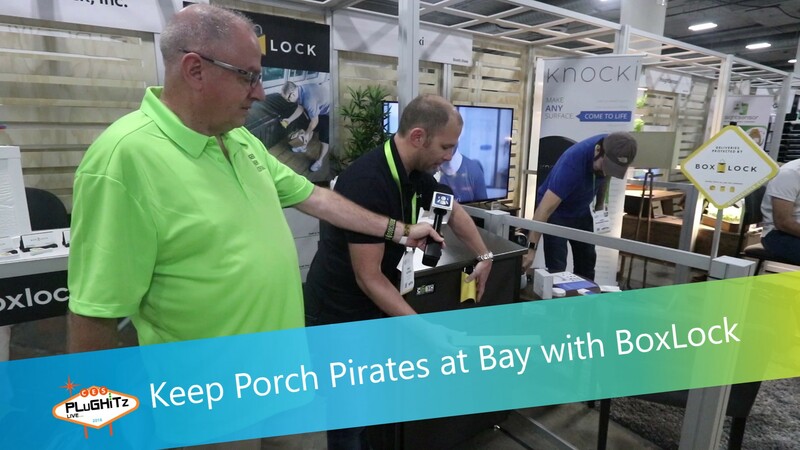 Several of the big delivery companies are on board including FedEx, UPS, USPS and Amazon, so it's perfect for keeping those porch pirates and packet thieves at bay. BoxLock is current InDemand on Indiegogo for pre-ordering at $109 (the video says $129 retail) with deliveries expected in June 2018.